Here it is, at long last, after three rounds of bruising and bloody playoff hockey: The New Jersey Devils play host tonight to the Los Angeles King in Game 1 of the Stanley Cup finals. It is the matchup everyone predicted at the start of the season and again at the beginning of the NHL playoffs. Just kidding. No one thought this would happen. The Devils flew happily under the radar all season in a stacked Atlantic Division that boasted higher-profile teams such as the Penguins and Flyers. The Kings, meanwhile, actually were the preseason favorites of many — but no one thought it would go quite like this, with the team nearly missing the postseason before cruising to a 12-2 playoff record against the Western Conference’s three top-seeded squads. Playoff predictions are always a folly, and if there’s one thing I do feel comfortable asserting it’s that the Stanley Cup finals will be no different. Still, here are a few things I could see happening, starting this evening with Game 1. 1. The first game will matter more than it usually does. In my Round 1 predictions, I wrote: “Unless the Kings can take Game 1 on the road, Canucks in 5.” (I’ve since used this cop-out to claim that I accurately selected Los Angeles, just so my conscience is clear.) Since then, they’re 8-0 in playoff away games, returning home from Vancouver, St. Louis, and Phoenix with a 2-0 lead in each series. 2. Jonathan Quick will post at least one shutout. While Jonathan Quick was by no means an unknown quantity heading into this season — in 2010, he was the USA’s third goalie in the Olympics — this was unquestionably his breakout campaign. Quick led the league in shutouts (10) and earned a .929 save percentage and a 1.95 GAA in the regular season. It’s a good thing, too: The Kings’ offense was so anemic that there were nine times when Quick gave up only one goal and Los Angeles still lost the game. In the playoffs, his numbers have been even better: He’s posted a 1.54 GAA off a .946 save percentage, and his aggressive, crablike style of play frustrated the teams’ Western opponents, particularly the normally high-scoring Canucks. “He’s quick. 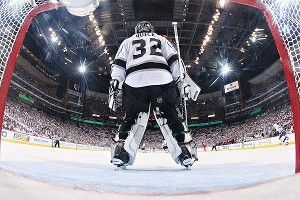 He’s Jonathan Quick,” Patrik Elias said. Martin Brodeur is a more interesting story. He was pulled in Game 3 against Florida after giving up three goals to let the Panthers back into the first-round game, but since then he’s been playing like a younger version of himself: handling the puck behind the net with abandon, stacking his pads old-school style, and serving as the institutional memory of a Devils franchise that has been one of the NHL’s most successful franchises of the past 20 years. While Quick is untested in the pressure cooker of a Stanley Cup final, Brodeur has been there, done that, and won that (three times). He’s cool-headed on the ice, laid-back in interviews — so much so that during one postgame press conference this past week, he was openly text messaging under the table — and, to hear him tell it, is having the time of his life. Still, he’s let in some soft goals and been tangled up here and there behind his own net, and is more liable to turn in a stinker. While I don’t think Brodeur will have a bad series by any stretch, Quick has more upside and ought to turn in at least one shutout performance. The good news for the Devils, though? As New Jersey coach Peter DeBoer pointed out today, they survived two shutouts from Henrik Lundqvist in their first three games and emerged no worse for the wear. 3. The best defense(men) will be a good offense. During the Eastern Conference finals, I compared the Devils’ forecheck to an insect infestation (it says a lot about the state of some of the places I’ve lived that I had such firsthand knowledge of the matter) after watching first Philadelphia and then New York struggle to complete even the simplest of breakout schemes. The Kings play a similar way, though, throwing all five guys in on offense and giving their defensemen some freedom to pinch. And it will be contributions from the blue line that could make the difference in this series. For guys like L.A.’s Scuderi and Willie Mitchell, it will be important not to let the Devils control too much possession. For New Jersey, the hope is that Marek Zidlicky can help out offensively. Having a speedy puck-moving defenseman like (the troll-gazey) Drew Doughty could help L.A. move the neutral zone, while the Devils are 8-0 in the playoffs when Bryce Salvador scores a point. 4. The distinctions between first lines and fourth lines will become increasingly blurred. New Jersey has an impressive top two lines, with one featuring Ilya Kovalchuk (who, incidentally, was deciding between the Kings and the Devils as a free agent in 2010) and the other Zach Parise. Still, it was New Jersey’s depth chart that helped it advance out of the East. As one person wrote to me on Twitter during the Eastern Conference finals, the Devils’ line of Ryan Carter, Stephen Gionta, and Steve Bernier was less of a fourth line and “more like a prequel to the first line.” The trio had a noticeable impact on the ice, and will need to continue their grinding play particularly because the Kings have more depth at forward than the Rangers did. Throughout their playoff run, the Kings have relied heavily on their fearsome top line of Dustin Brown, Anze Kopitar, and Justin Williams, with the second line of Jeff Carter, Mike Richards, and Dustin Penner also providing a formidable threat. But if Los Angeles is to win the Cup against a New Jersey team that has shown they can effectively manage top-line talent (see: Giroux, Claude), they’ll need strong performances from guys like Dwight King, who scored four goals in the series against Phoenix. 5. The winning team will have a legacy-defining performance from a 27-year-old American captain. I covered this last Friday (miss you, Ryan Callahan), but it’s more than just a U-S-A! rallying cry. Both teams draw their identities heavily from their captains — Brown for the Kings and Parise for the Devils — and will need these players to produce to have a chance to win. Since the Kings’ first-round series against Vancouver — when Brown’s physicality shook the Canucks and his goal scoring overwhelmed them — Los Angeles has dominated their opponents by playing heavy, hard-hitting hockey. Brown has been one of L.A.’s biggest offensive weapons: He scored five goals in the first three games against Vancouver, added two in Game 4 against St. Louis to give L.A. the sweep, and against Phoenix earned a goal and an assist in the first game and picked up three more assists over the course of the series. Another superior effort over the next couple of weeks would give him a strong case for the Conn Smythe. Parise’s offensive contributions haven’t shown up as much in the box scores — he had four points against both Florida and Philadelphia — but he ended a five-game goal-scoring drought in style with three goals and two assists between the pivotal Games 4 and 5 against the Rangers. What has mattered the most from Parise is his tenacious forechecking, which has helped set the tone for the Devils’ more freewheeling schemes. Welp, here goes nothing. (And I really do mean nothing.) I spent the last week in New York and New Jersey being thoroughly impressed by the Devils’ character, deportment, coaching, and, of course, on-ice play. The Devils are much older than the Kings and have the recent experience of battling back from 2-1 and 3-2 series deficits during these playoffs. Crucially, they’re a very cool-headed team: Flyers tried to get under their skin and failed miserably, and it’s unlikely the Kings will be able to rattle them the way they shook up the Canucks, the Blues, and the Coyotes. I just can’t see the Devils losing twice at home, and I think the series will head back to Los Angeles tied at one. It’ll be the first time the Kings will have found themselves in such a position — and unlike the other series they’ve played, this one will go longer than five games. they’ve played three of the league’s best regular-season teams (one of which was a game away from the Cup last season) and they’ve lost only twice. And while the layoff might mean they’re rusty early on, it might have also given them time to work on their woeful power play. I think they split Games 3 and 4 in L.A., steal Game 5 in New Jersey, and go home to win the Stanley Cup in six games in front of a delirious — and totally baffled — hometown crowd.